Most palaeoanthropologists accept that there are two separate lines or stages of hominin evolution, the australopiths and Homo. The key disputes concern the interpretation of Lucy and her Pliocene relatives, whether Australopithecus is a clade, or splits into several lineages, where A. africanus sits (either on the line to Homo, or as part of a distinct australopith clade), whether Homo is monophyletic or not and how many species of hominin to accept as valid. The current consensus (see cladogram (a)), if there is one, is that Orrorin is hard to position, that Sahelanthropus may be valid and may be the oldest human, and that the Pliocene species of Australopithecus should now be assigned to Praeanthro-pus (Strait et al., 1997; Wood and Collard, 1999; Cameron, 2003; Cela-Conde and Ayala, 2003). Australopithecus appears to sit on the line to Homo, whereas the robust australopiths, Paranthropus, are a distinct side-branch that led nowhere. 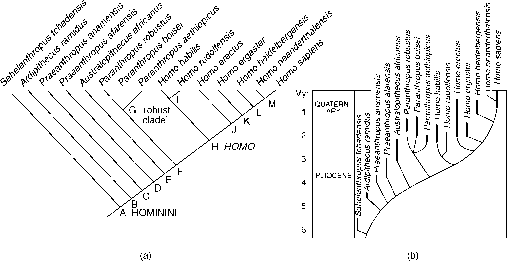 Homo is convincingly seen as monophyletic and to consist of some seven species (Wood and Collard, 1999), a dramatic turn-around from the views of ten years ago, when only three species were recognized (H. habilis, H. erectus, H. sapiens). Cladistic analysis of hominins is difficult (Wood and Collard, 1999), because (1) it is hard to define precisely the species and their characters, (2) material is often incomplete and critical characters cannot be studied and (3) the classic skeletal and dental characters that have always been used may give the wrong answers, at least in attempting to establish the relationships of modern gorilla, chimp and human (Gibbs et al., 2000; Collard and Wood, 2000). Further, some serious pruning of the numbers of taxa may be necessary (White, 2003) —some ten or fifteen new species have been named in the past few years. Relationships and evolution of humans: (a) cladogram and (b) phylogenetic tree of 14 hominin species, based on Strait et al. (1997) and Wood and Collard (1999). Synapomorphies: A HOMININI, bipedal posture, foramen magnum located forward in skull, large brain relative to body size, small canine teeth, U-shaped dental arcade; B, relatively long hindlimbs, basin-like pelvis; C, bipedal knee joint; D, lower first milk molar broad and short, canine and molar enamel thickened; E, brain size about 500 cm3, relatively small canine teeth, deep palate, enlarged ear openings; F, foramen magnum roughly horizontal, canines very reduced; G 'robust clade', large cheek teeth, very thick enamel, thick palate, thick zygomatic arch; H HOMO, cranial vault thick, postorbital constriction reduced, occipital bone occupies more of the length of the cranial vault, foramen magnum more anteriorly situated, reduced lower face prognathism, tooth crowns narrower, molar tooth row shorter; I, elongated anterior basicranium, cranial vault high, lower molars 1 and 2 elongated, narrow mandibular fossa; J, enlarged relative brain size; K, cheek teeth small, reduced number of premolar roots; L, 'eyebrow ridges' absent, chin. non-opposable big toe and straight phalanges in the toes. Apes and monkeys have a grasping foot with curved phalanges and an opposable big toe. The angle of the human knee joint shifts from being slightly splayed to being a straight hinge, and all the leg bones are longer. The hip joint faces downwards and sideways and the femur has a ball-like head that fits into it. The pelvis as a whole is short and bowl-like as it has to support the guts, and the backbone adopts an S-shaped curve. In apes, the pelvis is long and the backbone has a C-shaped curve to brace the weight of the trunk between the arms and legs. Bipedalism also introduced changes in the skull, as it now sat on top of the vertebral column, instead of at the front. The occipital condyles and the foramen magnum, the skull opening through which the spinal cord passes, are placed beneath, rather than behind, the skull roof. This makes it possible for a palaeoanthropologist to identify a bipedal hominid even from a small skull fragment in the region of the foramen magnum. The evidence for the evolution of bipedalism includes the oldest hominin skeletons, dated as 6-4 Myr old (see p. 378), and a trackway of footprints in volcanic ash dated as 3.75 Myr old. Bipedalism probably arose in the hominin line 8-5 Myr ago, when it split from the African apes. According to one theory, the forest-dwelling Miocene apes became restricted to the west of Africa, where they gave rise to the gorillas and chimps, after the Great Rift Valley began to open up, and the apes that remained in the east had to adapt to life on the open grasslands. A key adaptation to life in the open habitats was to stand upright in order to spot dangerous predators. Bipedal movement allowed these apes to carry food and other objects with them. The great majority of early human fossils, remains of this East African ape lineage, come from the eastern region of Africa, in a strip from southern Ethiopia, through Kenya and Tanzania, to Malawi and South Africa.